I have one more outfit to post before I get back to things I've actually made. We stopped at this great thrift store in Southern Minnesota* when I was on a college visit, and I got a couple really amazing items. 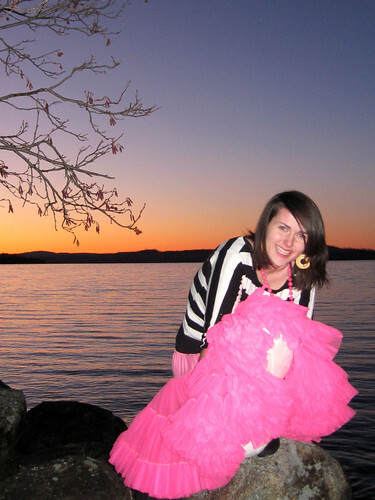 This post features my favorite: a petticoat! It's huge, vibrant pink, and oh so fun to wear. Haha, this picture makes me smile, because my nose is red; it was so cold! My hands were fair numb whenever I would run over to reset the self-timer on the camera. I also almost fell off the rock, which would not have been good! I'm so glad I didn't, as I'm not really a fan of swimming in late November. I promise there'll be a sewing update within a couple days! Oh man! Those pictures are amazing! I love how you use the lake as a background! It makes me want to visit so badly! Amazing outfit! It's so cute and it looks great on you. 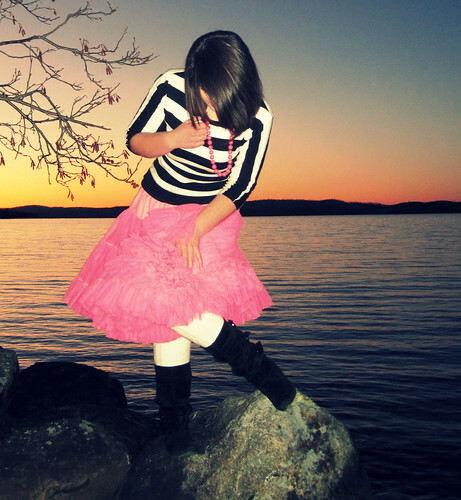 I also love the lake background and I sympathize with you about running to reset self timers. They are a pain! Haha, I usually just trip over myself when I run to reset the timer. Anyway, cool outfit and I can't wait to see more of your stuff. 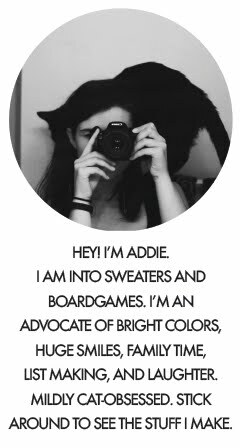 Your posts always inspire me! Dana - Aw, thank you! It's a very photogenic lake, isn't it? You need to come see me, darling! Brrr, I don't envy your -30 weather. It's been around 25-40 here, so actually very good for November! Love you too! It looks like a great big happy pink KA-BOOM! Love the silhouette picture and I want a petticoat like that sooo bad!! Whitney - Thank you!! Check Etsy... they're sometimes pretty expensive, but you might find a deal, especially since it's gonna be such a huge sale weekend!